A-Train is a great tool for productivity. In the mornings, it can even be taken in lieu of a cup of coffee to jumpstart the day and sharply boost energy. Moreover, its intense cerebral high brings a rapid hurtle of euphoria that very few strains can parallel. Its genetics have crossed oceans, tracing to dynamic roots in the capital of household cannabis strains Mazar I Sharif. It brings forth a heavy-limbed high with the exotic addition of an almost crippling euphoria. Such extremities are balanced out with Trainwreck, a high-powered Sativa known for its speedy mind sweep. This diversity has created a strain laden with astronomical levels of THC, promising an intensely psychedelic experience before descending to a calming stop. This strain’s scent can be likened to the strong scent of hash. Its fragrance lingers as a bag is opened but it leaves the room smelling pungently sweet with subtle earthy notes. Often lauded for its flavorful buds, it boasts an amalgam of flavors that burst in the palate as soon as a puff is toked. Enhancing the sweetness is the spicy taste of herbs. On the exhale, a cooling mint along with a floral aftertaste linger in the mouth. A-Train goes from zero to a hundred in a matter of minutes, similar to the world’s fastest bullet train. Up front, it delivers an intense buzz that can topple veterans off track. However, if taken with caution, its rush of euphoria clears the mind until the world seemingly takes on a new depth as the senses sharpen. It is an ideal choice for social gatherings as it acts as a contagious social lubricant. It leads to colorful conversations as well as bouts of uncontrollable laughter. More casual users can also make use of the strain’s creative propensities for a brainstorming session. Regardless, it inspires a sense of happiness as one feels fulfilled with the connections made with friends or the new perspectives. After a few hours, the cerebral elation slowly shifts into a tingling sensation that trickles to the rest of the body. It wraps the body in a blanket of lethargic relaxation. Keeping it from locking users to the couch is the initial head high that persists even as the high wanes. Because of its great wake-and-bake qualities, A-Train is highly recommended for the workday. It is a brilliant choice for hobby ventures or low-key housework as the heart-racing start tends to finish with heavy eyelids at its end. Without a doubt, the herb is incredibly potent. As such, its promise to rid people of unrest should be taken with a grain of salt. After all, it can be intense enough to cause paranoia or anxiety when indulged without restraint. Though brief, such discomforts are better off avoided entirely by starting with a minimal dosage. Most of the time, however, the side effects are only characterized by dryness in the eyes and the mouth. It may also be accompanied by a slight dizziness too. Downing a few glasses of water will help manage the dry spell throughout the day. A-Train is the go-to bud for an immediate mood-lift. The high concentration of THC offers powerful, psychoactive compounds that immerse the mind in delight, and a lazy demeanor is replaced with head-rushing zeal. Beyond entertainment, the psychedelic effects provide a temporarily soothing solution to some psychological ailments as it helps long-sufferers of depression appease the mental anguish. Stressed-out minds are also calmed by the herb’s anxiolytic properties, allowing people to enjoy daytime activities without worrisome distractions. The same properties that enlighten the mind also naturally stimulate the stomach. For this reason, it is a source of comfort to patients with eating disorders like cachexia. It also encourages a hearty appetite for people with cachexia. In high levels, THC naturally relieves chronic pain and reduce inflammation, effectively easing joint aches, migraines, and muscle cramps. Due to its long-lasting effect, patients can drift off to a peaceful slumber at night and wake with lingering relief in the morning. A-Train bears a humongous cola with dense pinecone-shaped buds. Each one with streaks of fiery pistils scattered like a blaze. With a thick layer of resin, the nuggets show a definite sign of its impressive potency. However, its foliage can be quite thick and will need constant trimming and pruning. Not only that, its height is quite tall so topping it early will help maintain its size. Apart from keeping it short, it will also improve light and air distribution while lowering humidity levels. Indoors, planting the seeds in either soil or hydroponics allows it to mature handsomely. The former enhances the flavor and scent of the buds while the latter significantly contributes to plant health and, thus, a higher yield. In batches of four, A-Train will produce between 350 to 450 grams of buds per square meter. Having an indigenous landrace for a parent can greatly increase a plant’s resistance to the unpredictable weather of the outdoors. Generally, though, A-Train likes locations with constant sunshine and pleasant all-around conditions like the Mediterranean. Moreover, pairing it with Low-Stress Training (LST) techniques like the Sea or Screen of Green will enhance plant health in farms and gardens, trichome production, and produce. This is not to say the plant will not grow well in the northern hemisphere. Rather, it will flower late between the last week of September to the middle of October. Still, it yields high with each plant producing at least 450 grams per plant. Have you grown or used the A-Train strain? 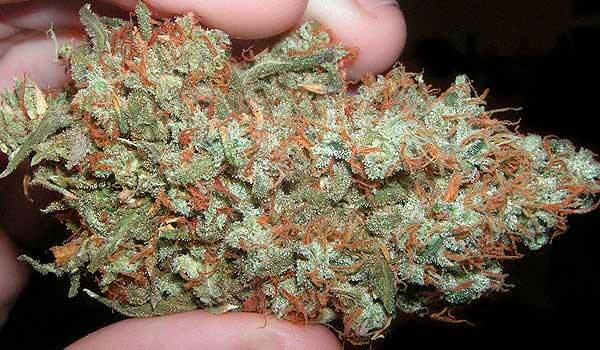 If not, would you like to get your hands on this strain? Please leave a comment to let us know what you think. We want to hear from you.